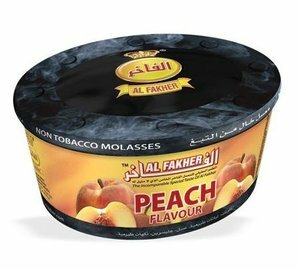 Al-Fakher has been providing great quality tobacco for an amazing price since 1999 and have now entered the Herbal Shisha (Non-Tobacco) market in its quest to please Hookah smokers worldwide with both tobacco and herbal molasses products. Founded in the United Arab Emirates (UAE), this revolutionary new hookah product is manufactured using only the finest blend of exotic herbs to produce the highest quality smoking session that can be achieved from a non-tobacco product. Though not as juicy as the traditional brand, Al-Fakher Premium Herbal Molasses is 100% Tobacco Free, Nicotine Free, and Tar Free, offering the smoothest, longest, and most enjoyable smoking experience available. Their 200 gram jars allow for Hookah users to smoke several times a month or with large groups of friends. Al-Fakher Herbal Molasses comes in a container with an internal container inside to lock in the freshness but make sure to store it at room temperature in an airtight container. Al-Fakher Herbal Molasses is very juicy and produces the best results when using a normal pack in a phunnel bowl or vortex bowl. Always mix up your herbal molasses to redistribute the juices throughout the blend and then sprinkle it in producing a fluff pack and lightly pat down until all stray leaves are smoothed out and it reaches the edge of the rim. Sight foil contact is fine just don't overdo it and make sure the holes are not too excessive or too large as to not burn it. You can start hitting it directly after putting on the coals as Al-Fakher gets going quick but it is recommended to start with 2-3 hookah coals depending on the size of the hookah bowl you are using and work your way up if you want more heat; just keep in mind that too much heat can make it turn harsh. 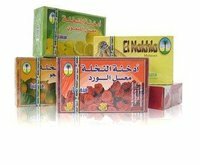 Al-Fakher Herbal Molasses is an excellent choice for our International customers since this product is 100% Tobacco Free and therefore should not be subject to the high tobacco taxes that customs may charge at the border of certain countries.